Special Report Five years have passed but the wounds left by the acquisition and dismemberment of Europe's biggest technology company at the hands of Microsoft remain open. Nokia today is a considerable multinational, of course, booking €23.15bn in FY2017. But that's around half of what Nokia was at its peak in 2007 (€51.6bn). It's the intangibles that have been lost: Nokia was a trailblazer, the speaker of a global language that could sell electronics to every class or culture, and the pride of Finland – a nation most Americans couldn't find on a map before the 1990s. Many probably still can't. Almost all of the 32,000 employees of Nokia's phone division subsequently lost their jobs, and CEO Stephen Elop was personally vilified as the agent in an elaborate conspiracy theory. Some of this angst is justifiable. The deal had been done by outgoing Microsoft CEO Steve Ballmer, who called it his "best idea". The deal formally closed weeks after Ballmer's successor Satya Nadella took the reins. Nadella, though, didn't see the point of the acquisition – as he later admitted – and the Microsoft board had been lukewarm the whole time. El Reg was told that Nadella had personally assured top staff who didn't know whether to stay with Nokia under the new owner that the future was bright. And in one-on-one situations, he can be incredibly persuasive. But public statements were ambivalent, and Nadella's would become notorious for their obfuscation. Jean-Louis Gasseé called the verbose, word-mangling Nadella "a repeat befuddler" and shrewdly predicted phones were for the chop. The axe soon started swinging. It was painful. Nadella had wanted to cut the fat from Microsoft even without the addition of Nokia's phone unit – which included not just the smartphones but the dumbphones that Microsoft never wanted, too, as well as manufacturing plants in South Korea, China, Hungary, India, Mexico and Vietnam. In July 2014, Microsoft announced its biggest ever layoffs – 18,000 – with a disproportionate 12,500 from the newly acquired Nokia unit. That hit Oulu, Beijing, San Diego and the Komárom factory in Hungary. Elop tried to put a brave face on it, vowing: "We will focus on breakthrough innovation that expresses and enlivens Microsoft's digital work and digital life experiences." It wasn't long before he struck again. 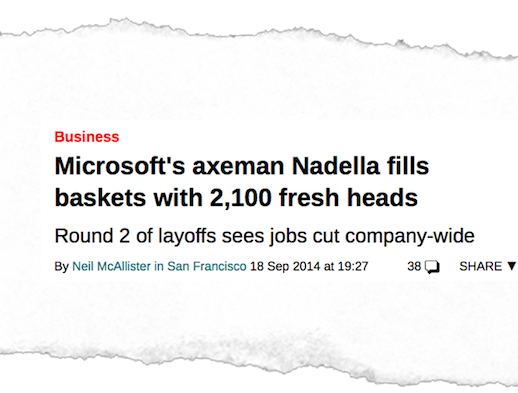 "Microsoft's axeman Nadella fills baskets with 2,100 fresh heads," we reported only two months later. The following February, the axe was swung again, and Beijing and Dongguan were culled. Throughout 2014, Microsoft continued to release excellent products that had been in the pipeline – while quietly cancelling others, like a smartwatch. By mid-2015, more mixed messages came from The Befuddler-in-Chief. Nadella was becoming famous mainly for his waffle. "Unreadable, largely meaningless hyperbole," said Lucy Kellaway, The Financial Times' waffle-watcher. "I am committed to our first-party devices including phones," Nadella wrote. "However..."
When the smoke cleared, we learned he committed Microsoft to giving "value phone buyers the communications services they want; and Windows fans the flagship devices they'll love". But with the Nokia cull ongoing, it was obvious that Windows Phone had one foot in the grave, a victim of infighting at the platforms group with "Windows 10 everywhere" winning. From now on, Microsoft mobile would be a variant of Windows 10, with a tweaked look and feel. One codebase, running UWP apps. Unsurprisingly, with the market starved of exciting new products, the last flagship was now well over a year old and revenue collapsed. Microsoft would admit in a regulatory filing in July: "In the third quarter of fiscal year 2015, Phone Hardware did not meet its sales volume and revenue goals, and the mix of units sold had lower margins than planned." When new Lumias appeared at the tail-end of 2015, it felt like a contractual obligation album. The joyless nature of Windows 10 Mobile wasn't helped by bugs: it was "months away from being mature", we noted. It all felt like a hastily arranged affair, one that only superficially resembled the beautiful, spare and functional made-for-phones original. The Lumia 950 camera, with its oversampling 20MP sensor and optical image stabilisation, was arguably two years ahead of anyone else's, as these sumptuous pictures from our December 2015 review show. Then it vanished without trace. The final Lumias appeared in February 2016 and the death toll was now almost 20,000. But Nadella hadn't finished. 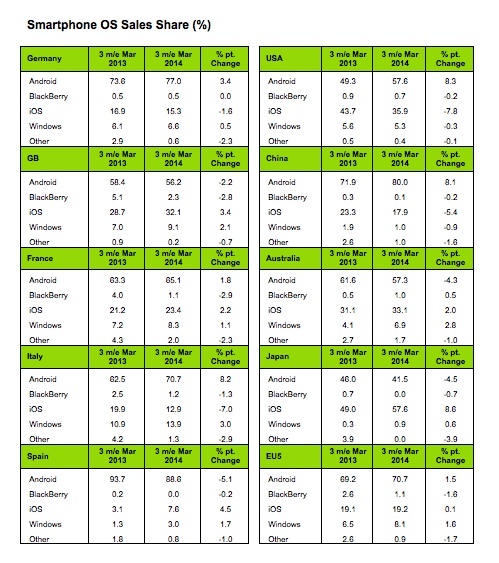 What rankles is that Nokia only began to roll out a full portfolio of Windows Phone devices, across different price points, throughout the spring of 2013. Just as the Nokia board was meeting to discuss a Plan B to its Microsoft partnership. The attention-grabbing flagship Nokia Lumia 1020 – with its 41MP camera – wouldn't be launched until July. According to some accounts, Nokia's board bottled it, handing it to the bloodthirsty SatNad, who ruined a potentially wonderful business that was just going swimmingly. But this account has a few problems, doesn't it?